Long thought lost, The Ghoul resurfaces in its complete form some seventy years after audiences were first bored to tears by it. 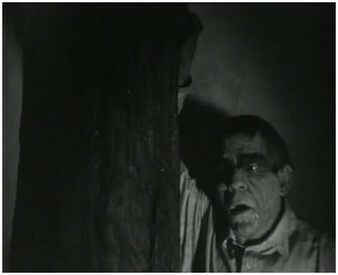 Starring Boris Karloff, this is an old time monster snooze-a-rama of the first degree with scintillating scenes of groups of characters standing around yakking at one another, faulty comic relief, limited playing time by the star, and an emphasis on dreary dialogue and static camera work over everything else. While things manage to come alive a bit for the ending, since it all involves a bunch of goofs fighting over an ugly broach, even that wasn’t enough to save this creaky contraption of life-after-death mumbo jumbo. Boris is again obsessed with ancient Egypt as he was in the previous year’s (and vastly superior) The Mummy. This time he plays an Egyptologist named Professor Morlant. The professor lives in a house that’s decorated like Boris got some kind of discount on the set decorations from The Mummy. Statues, urns, carvings and the like litter his London home, the giant idol of Anubis in his bedroom making some sort of home decor statement that easily clues us in that Prof. Morlant was single. The professor though has more pressing issues though than his hieroglyphic hobby cramping his love life. He’s near death and still has to ensure that his plans for immortality are carried out. Why otherwise ingenious types who have the ability to play God always entrust important aspects of whatever scheme they’re cooking up to their greedy, handicapped, and generally dull-witted assistants is beyond me. We’ve seen this time again, most famously of course when Dr. Frankenstein gave Fritz a simple shopping list that surely looked like this “1. Brain of genius” and Fritz still managed to somehow come back with the half-rotted cantaloupe of an executed killer. Here, Morlant needs to be buried with a fancy jewel so that he’ll have it to offer to Anubis after Morlant dies and then Anubis will grant him everlasting life. Hopefully Anubis will throw in a complimentary facelift because at this point Morlant was looking a little rough. No plan in the history of man that involved Anubis, immortality, and a mysterious jewel has ever gone off without a hitch, so you’re basically ticking down the seconds until someone moseys on up to Morlant’s corpse and swipes the jewel. It wouldn’t be much of movie though if it was just about Morlant getting pissy because his butler stole the family jewels now would it? Don’t you worry about that because as soon as the movie began, it featured a sinister guy in a fez! We all know what that means! The Egyptians want their jewelry back and will stop at nothing to get it! Even if that means engaging in yucky sexual innuendo with the friend of Morlant’s niece! I would have hoped that one of the benefits of watching an old boring horror movie from the 1930s would have meant that no matter what else I had to put up with, it wouldn’t be giggly dirty talk! I suppose it was no worse than the decision to have our two leads being feuding cousins, who seem to have this undercurrent of unnatural attraction as the movie went along. Was this the fog-shrouded streets of London or the dirt roads of Arkansas? Other characters mill around with varying degrees of interest in the proceedings including a nosy parson and Morlant’s lawyer. No one seems to take old Morlant’s plan to come back from the dead too seriously, but since he disappears until the last twenty minutes of the movie once he dies the first time, that’s perhaps understandable.<p. Only once he finally wakes up with a mad on about the fact that someone ripped off his broach does the movie show any signs of life, but Morlant just goes around choking people in an effort to find it, so even though his skin is a bit dried up, he’s nothing to write home about and he’s certainly no Mummy. 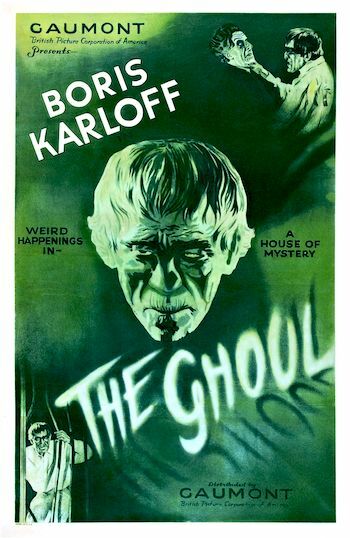 Sluggish until the final scenes when it turns surprisingly violent, The Ghoul doesn’t give Karloff much of chance to showcase anything other than his scary face. Morlant is just a guy we meet as he’s getting ready to die and the rest of the characters merely try to out talk one another while seemingly waiting for Morlant to come back and wake them up along with the audience. I’m also not sure if I really grasped what all this was about. Morlant comes back to life to steal his jewel back so that Anubis can grant him immorality and allow him to come back to life a third time? Does that make any sense? 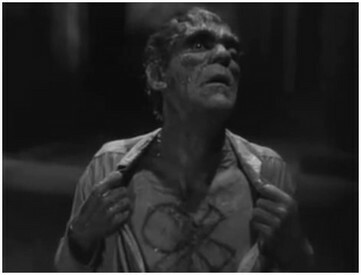 Those who are fond of these old movies that take place in shadowy houses and the misty outdoors will find those scenes in ample supply, but with the bland monster and the painful non-action of the first 70 minutes it would be difficult for all but the hardiest Karloff fan to remain conscious during this one.